You are here: Home / What is CYP450? Cytochrome P450? medication induced violence? important for me to know? In the treatment of mental disorders (such as anxiety disorders and depression) medication is often used. Many of these drugs and many other external substances are metabolized (processed) by the enzymes of the cytochrome P450 system. With a DNA defect on cytochrome P450 genes, certain drugs and substances can not be metabolized properly. The side effects can be so serious that the user can develop a psychosis based on medication poisoning – a toxic psychosis or a delirium or akathisia. Toxicity due to psychoactive medication can lead to vague complaints of restlessness, anxiety, nightmares up to a state of fully developed akathisia with extreme violence, murder, manslaughter or suicide. The DNA that codes for the enzymes that influence the conversion of drugs is called Cytochrome P450. Enzymes are proteins that are involved in reactions in biological processes and act as catalysts. P450 enzymes are found everywhere in the animal and plant kingdom. They metabolize a large number of substances within the body, as well as substances from outside the body, such as medication. P450 enzymes are found mainly in the liver, but are also present in the intestines, the lungs, the brain and the kidneys. The genes encoding the P450 enzyme system consist of 18 families and 44 subfamilies. A family name is indicated by a figure, for example CYP2, then followed by the subfamily with a capital letter, for example CYP2D and finally the individual gene or enzyme with a number again: CYP2D6. Each individual has two copies of each gene, one inherited from each parent. The variant form of a copy is called an allele. The alleles are indicated in the nomenclature with an asterisk * and a number, for example 1, separated by a slash /. If someone inherits the same allele from his father and mother, this can for example be CYP2D6 *1/*1. If someone has received two different alleles from their parents, it could be CYP2D6 *1/*3 for example. The alleles that are considered normal (standard) are called “wild type” and are most common in the general population. Every allele, other than the wild type, is called “variant” or “polymorphism”. Someone with normal metabolism is called an “Extensive Metabolizer” or “EM”. Such a person has two copies of the wild type alleles. Polymorphism occurs when a variant allele replaces one or both wild type alleles. In general, variant alleles encode a Cytochrome P450 enzyme that has reduced or no activity. Individuals with two copies of a defective allele are called “Poor Metabolizers (PM)”, while those with one normal allele (wild type) and one defective allele or two partially functioning alleles are referred to as “Intermediate Metabolizers (IM)” and have a reduced metabolic activity. There are also people who inherit multiple copies of wild type alleles and therefore the gene produces more enzymes. These people are called “Ultra-rapid Metabolizer (UM)” or super-fast metabolisers. The efficacy of the Cytochrome P450 enzyme system is genetically determined and is also influenced by intrinsic factors such as age, gender, comorbidity (other diseases present) and extrinsic factors such as diet, smoking, substance abuse (drugs, caffeine, alcohol) and medicine-interactions (comedication). The CYP3A4 and CYP3A5 enzymes metabolize 45% of all medication that is available with and without prescription. One can imagine that a defect on this CYP has severe consequences for people using medication that relies on a good functioning enzymes. Taking medication in combination with the use of alcohol for instance can be quite dangerous. This CYP has a 16% share in metabolizing medication. A simpel painkiller like Advil inhibits this specific gene, but it also needs this gene to function properly since the gene uses Advil as a substrate. Has a 13% share in metabolizing medication and it is an important gene for people who use marijuana. Especially in combination with an antidepressant like Sertraline, it can be dangerous if someone has a defective allele on this gene. CYP2D6 has a 12% share in metabolizing medication, so also quite a big share. Sertraline and Paroxetine are examples of antidepressants that need this gene to be fully functional. This CYP has a 7% share in metabolizing medication and is especially known for the fact that the use of tobacco induces the functionality of this gene. This means that a smoker with variant alleles on this gene, can produce too many enzymes that speeds up the metabolizing of medication. Only 3% of all medication relies on this gene, but it is still important for a lot of people since Alcohol and Paracetamol are metabolized by the enzymes produced by this gene. This CYP is responsible for metabolizing 2% of all medication. Only has a 2% share, but quite important for people who have to undergo cancer treatment. 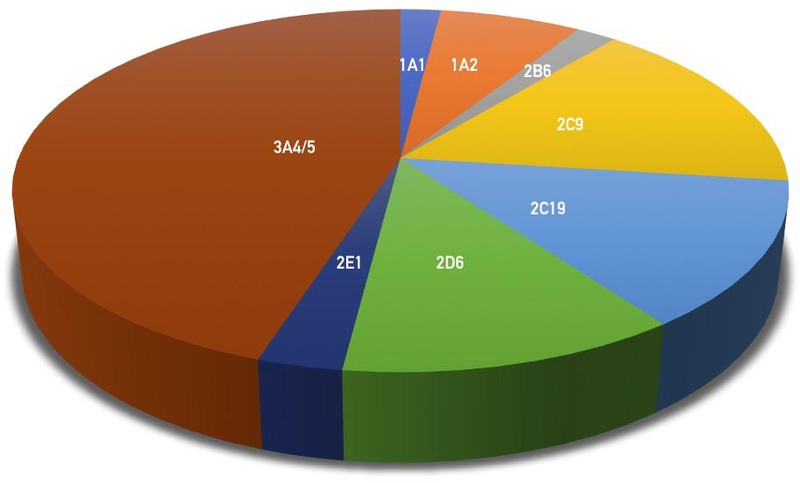 There are more than 50 Cytochrome P450 enzymes involved in converting drugs, but CYP1A2, CYP2B6, CYP2C8, CYP2C9, CYP2C19, CYP2D6 and CYP3A4 metabolise the majority of the drugs. That is why a laboratory like IFS tests these specific CYPs. If desired, a more extensive test can be performed to generate a more complete profile, including 50 CYPs. Medication can be metabolized by a P450 enzyme, i.e. the enzyme uses the medication as “substrate” = S (substance to be converted). A drug can be both substrate and inhibitor for a certain enzyme. Advil is metabolised by enzymes of CYP2C8, CYP2C9 and CYP2C19, but at the same time inhibits the functionality of the enzymes of CYP2C8 and CYP2C9. These are called gene-drug interactions. When medication is combined, drug-drug interactions can arise. These interactions can cause problems in the conversion of medication, which may increase the amount of medication in the blood (blood levels). With the rise of blood levels, the chance of side effects also increases. An increase in interactions leads to a darker color in the tables. When more medication, that relies on metabolizing by enzymes of CYP450, get into the blood, the greater the interactions get, and the chance of a delay in the metabolization increases. In the combination, Paroxetine inhibits the functionality of all CYPs. However, CYP2C8, CYP2C9 and CYP2C19 are required for the metabolization of Advil. Because Paroxetine inhibits the functionality of these CYPs, Advil will be metabolized much slower . This causes the blood levels of Advil to rise, increasing the chance of side effects. In summary, there are various ways in which a substrate can be metabolized in a delayed manner. The first is by inhibition (Inh), the production of enzymes is delayed by a substrate. Less enzymes means less capacity to convert a substrate. The second is by competition: as long as an enzyme is busy metabolizing one substrate, it can not work on the metabolization of another substrate. This creates competition between the substrates for the enzyme. With two or more substrates it can mean that none of the substrates can be metabolized properly. A third way is due to the genetic disorder (polymorphism), because of this the gene produces a delayed working enzyme. A polymorphism can give gene-drug interactions, inhibition and competition are drug-drug interactions. The genetic abnormalities can be tested fairly easily at a laboratory like the one from Independent Forensic Services. As long as an enzyme is involved in metabolizing one substrate/medicine, it can not work on the metabolization of another substrate. This creates competition between the substrates for the enzyme. As a result, the blood levels of the medication in question will rise even further than they already do because of the fact that the gene has a loss of function and is therefore less effective. CYP2D6 is needed to metabolize Paroxetine. But due to the long-term use of paroxetine, the gene most likely has a greatly reduced effect. CYP2D6 can hardly contribute to the breakdown of Paroxetine. CYP1A2 will contribute slightly to the conversion of alcohol. CYP1A2 produces more enzymes if someone smokes. If someone does not smoke, the gene is working normally. It can contribute to the conversion of Paroxetine as a back-up, but now there is competition with alcohol and inhibition by Paroxetine. CYP2C19 is also a back-up for metabolization Paroxetine, but is inhibited by both Paroxetine and alcohol. CYP2C19 will therefore contribute to a lesser extent to the breakdown of Paroxetine. The combination of inhibition of the genes resulting in less enzyme production and the competition between the substrates ensures that CYP1A2, CYP2C19 and CYP3A4 contribute to a lesser extent to the breakdown of Paroxetine and alcohol. The blood levels of both substrates will most likely increase with an increased risk of side effects and intoxication. This effect only increases if deviations are found. Would you like to know your CYP450 profile?